There are several possible ways to germinate Cannabis seeds; here we describe the most important ones. At Royal Queen Seeds, we only sell feminized cannabis seeds, so it's not necessary to eliminate male plants. 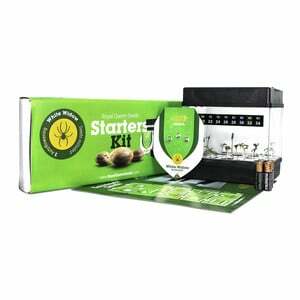 Germinating with this kit is perfect for a beginner grower who wants an optimal germination for his cannabis seeds. 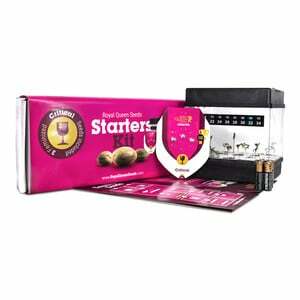 * You will also need a measuring cup and a stirrer (not included in the Seedkit). 250 ml of Seedbooster is exactly enough to germinate ten seeds. Pour it into the measuring cup, taking care to use the exact quantity for the number of plugs. For example, if you want to germinate five seeds, only use half the Seedbooster. Then add 125 ml warm water (for every 125 ml of Seedbooster). Place the germinating plugs in the container and carefully pour the mix over them, so they will directly absorb the nutrients. Wait a few minutes until all dampness is absorbed. Then, making sure your hands are clean, carefully place your seeds about 5 mm deep in germination seeds. Do this extra carefully and make sure you don't apply too much pressure on the seeds. Now place the cover on the box, closing it tightly. This helps create the best climate for germinating, and the seeds should grow more quickly. Keep the container in a warm room, at a temperature of about 20°. Wait five days for germination, then turn the cover 180° in order to create a small opening that allows the plants to breathe fresh air. Make sure there is always plenty of natural or artificial light. You'll obtain the best results with fluorescent lamps. (Coolwhite - colour code 33 - gives optimal results). Place your seeds in a glass or bowl full of water at a temperature of about 20° Celsius. After 3-5 days you should see some tiny white tips, and the seeds should open. These tips are the beginning of the roots; you can remove your seeds from the water when the roots reach 2-3 mm, using extreme care. 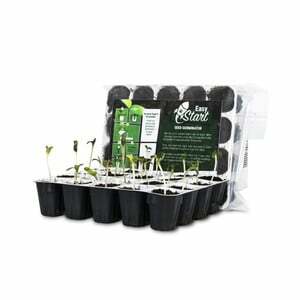 Now you can move them to soil, to a hydroponic culture or with any other method you prefer. Make a small hole (5 - 10 mm) and carefully place the germinated seed in its new environment. It's important not to use too much water; and always use a squirt gun. Make sure the fluorescent light is very close to the plant; a very common error is keeping the lamp too far from the plant. Germinating in water does not, however, yield the best results possible. Dampen two layers of paper towels with warm tap water. Place the cannabis seeds between the two layers and check every day to see if they're damp enough. In a few days, the seeds will probably have begun to germinate and can be moved to a different environment, provided the new environment is still very damp and sufficiently illuminated. Germinating directly in soil is a very frequently-used technique; it's not necessary to re-pot your plants, and the more fragile plants aren't disturbed during the growth process. For this method, it's very important to use top-quality soil (enquire at your local grow shop about the different types of soil for vases). Plant the cannabis seed about 1 cm deep in the soil. Cover the hole with other soil, without compacting excessively. The soil must be lightweight, in order to allow the plant to sprout easily. The cannabis seeds should germinate below ground and sprout after 4-10 days. With this method too it's important to place them in a damp and ventilated environment, at the right temperature.